Ron's Colloidal Silver Lavender Gel cleared up bloodhound's hotspot in one application! 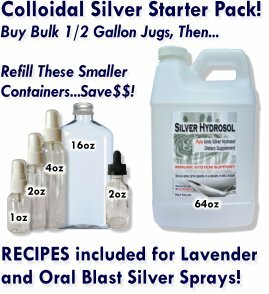 I have been using colloidal silver products for years. I was so happy to find Ron after Helping America disappeared because I bought from them for years. I tried some of Ron's Colloidal Silver Lavender Gel on a hot spot my Bloodhound had. ONE time and it cleared it up. It was a huge hotspot also. I wish I had thought to take before and after pictures. Comments for Ron's Colloidal Silver Lavender Gel cleared up bloodhound's hotspot in one application! Thanks for sharing this news about our colloidal silver gel! Thanks GREAT news! It's stories like these from customer friends that makes offering these products so rewarding!